New Bern, NC Bojangles'® Tands, INC. Store #22 - Bojangles'® / Tands, Inc. The New Bern, NC Bojangles’® location is a favorite for visitors and locals alike. 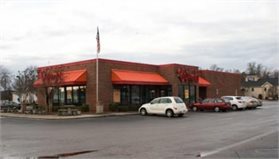 Located in the James City area on Hwy 70, this New Bern Bojangles’® is near the New Bern Airport and historic downtown New Bern district. Travelers, visitors and residents of the area enjoy both the authentic comfort food and convenient location of the New Bern Bojangles’®. New Bern loves the crispy fried chicken, buttermilk biscuits made daily from scratch, and other southern-style options on the Bojangles’® menu. Any time of day, you can satisfy your cravings with a breakfast, lunch or dinner from Bojangles’®.